"I have taught from and enjoyed the first edition of the book. The selection of topics is the best I've seen. Maurizio Spurio gives very clear presentations using a generous amount of observational data. " This is the second edition of an introduction to ?multi-messenger? astrophysics. It covers the many different aspects connecting particle physics with astrophysics and cosmology and introduces high-energy astrophysics using different probes: the electromagnetic radiation, with techniques developed by traditional astronomy; charged cosmic rays, gamma-rays and neutrinos, with methods developed in high-energy laboratories; and gravitational waves, recently observed using laser interferometers. The book offers a comprehensive and systematic approach to the theoretical background and the experimental aspects of the study of the high-energy universe. The breakthrough discovery of gravitational waves motivated this new edition of the book, to offer a more global and multimessenger vision of high-energy astrophysics. This second edition is updated and enriched with substantial new materials also deriving from the results obtained at the LIGO/Virgo observatories. For the first time it is now possible to draw the connection between gravitational waves, traditional astronomical observations and other probes (in particular, gamma-rays and neutrinos). 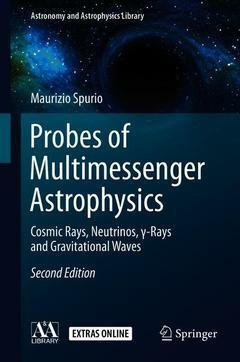 The book draws on the extensive courses of Professor Maurizio Spurio at the University of Bologna and it is aimed at graduate students and post-graduate researchers with a basic understanding of particle and nuclear physics. It will also be of interest to particle physicists working in accelerator/collider physics who are keen to understand the mechanisms of the largest accelerators in the Universe. Preface.- An Overview of Multimessenger Astrophysics.- Charged Cosmic Rays in our Galaxy.- Direct Cosmic Rays Detection: Protons, Nuclei, Electrons and Antimatter.- Indirect Cosmic Rays Detection: Particle Showers in the Atmosphere.- Diffusion of Cosmic Rays in the Galaxy.- Galactic Acceleration and Acceleration Mechanisms.- The Extragalactic Sources and Ultra High Energy Cosmic Rays.- The Sky Seen in γ-Rays.- The TeV Sky and Multiwavelength Astrophysics.- High-Energy Neutrino Astrophysics.- Atmospheric Muons and Neutrinos.- Low-Energy Neutrino Physics and Astrophysics.- Basics on the Observations of Gravitational Waves.- Microcosm and Macrocosm.- Conclusions.- Index. Maurizio Spurio is a Professor of Physics at the University of Bologna where he teaches Particle and Astroparticle physics. With his research he is involved in experimental physics, with particular interest in high-energy physics without particle accelerators and astroparticle physics. He was member of the MACRO experiment at Gran Sasso underground laboratory, which provided a deep study of the penetrating component of the cosmic radiation including the observation of atmospheric neutrino oscillations. Since 2001 he is member of the ANTARES experiment (the first neutrino telescope in the sea), currently in charge as deputy spokesperson. Professor Spurio has already co-authored/edited 4 Springer books.